The beautiful Cycladic island of Kea (Tzia), with traditional villages, cobbled alleys, archaeological treasures and beautiful beaches is waiting to start the 23rd Cyclades Regatta. The Cycladic island, apart from other Cycladic islands stands out because of its lush full evergreen areas as well as rare species of plants that can be found on it. Of course, the beautiful beaches do not have anything to be jealous of from the other Cycladic islands . 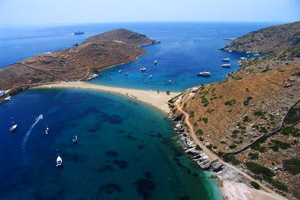 Spathi , Psathi, Orkos, Gialiskari, the Three Beaches are a few of the beaches you can visit in Kea. Furthermore, you can visit the Medieval Castle, the Temple of Apollo, the Lion monument of Kea, and various monasteries and churches that can be found on the island. Wander through the island and enjoy the sea, the beautiful scenery and amazing sunsets. Don’t forget to try the kitchen of Kea and especially the local specialties "paspala". Kea is definitely a fairly mild in rhythms island that can provide you with carefree and relaxing holidays. Milos with its strange horseshoe shape, as emerges from the blue waters of the Aegean, bathed in bright light and adorned with white houses, Milos with the hospitable inhabitants, Milos with good tourist infrastructure, clean beaches and the remarkable monuments stealing the hearts of those who visit the island. 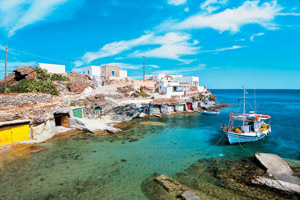 In antiquity Milos flourished because of its mineral wealth. Inhabited since the Neolithic era (7000 BC) and soon prospered more than its neighboring islands thanks to obsidian, a black volcanic rock used in weapons and their tools. Adamas (or Adamantas) and the island in general, provides us with anything that will make our stay more comfortable and our holiday more enjoyable, combining relaxation and tranquility with its vibrant nightlife and entertainment. Here in Adamas, we can enjoy swimming, sunbathing or water sports on one of the two beaches. From Adamas, little excursion ships depart daily, making an island tour and stop at several beaches for swimming and eating in Kimolos (a nearby island). The pirates called it "Arzantiera" meaning "Silver" for its unique sparkle. Others again gave it other adjectives such as the "Echinousa" and "vipers" because of the secrets which are hidden in the earth and the sea. Untouched, uncluttered, Kimolos, is like a white dash in the blue Aegean, although born of volcanic anger has beautiful bays with turquoise waters and white sands, which remind you of the Caribbean. With no Central Towns or villages, but only one village which is located high on the hill, white, tidy, clean, with its medieval castle dominating the top. 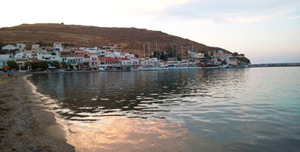 Kimolos is modest, humble, genuine and this is something that is reflected in its inhabitants. It is a playful island and this can be seen from the rock strange sculptures that nature has created on it. It is a young at heart island which now beginning to "grow", fortunately with mild pace, and the small harbor with its green water and the blue and white houses standing proudly on the background have now a new mooring pier to welcome us. Kythnos, which in ancient times was known as Afiousa, Thiramnia, Thermia etc. named after the leader of Dryopes, who came from Evia and settled on the island. Another version says that the name was born from the root "kyth", derived from the verb "keftho" meaning “hiding” relating it to the place where one can hide. There are two villages, Kythnos (Chora or Mesaria) and Dryopida (Village or Syllaka). Each village has its port. The town has the Baths and Dryopida Merihas. The village Loutra takes its name from the hot springs. Archaeological findings prove that springs were operational back from the Roman times and today are the only operational in the Cyclades. 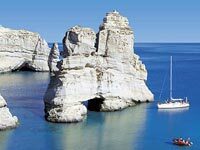 It has countless beaches, Cycladic scenery and local hospitality. Kythnos if filled with countless bays, coves and unique beaches with crystal clear waters and plentiful shading from the trees. The 24th Cyclades Regatta ends at Kythnos.